We weren't familiar with the Armenian ritual of the "red apple," in which - even today - the groom's family inspects a bridal couple's bedsheets to ascertain the bride's virginity. If the requisite virginal blood is found, tradition dictates that the groom's family send the bride a bowl of red apples. " 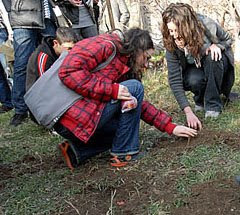 To mark International Women's Day, a group of women staged a "burying the red apple" march, in which they quite literally submerged a series of the symbolic objects in soil, to protest the inherent double-standard of the archaic tradition. The ritual may seem archaic to us, but the march has generated controversy. Said one agitated bystander, somewhat baffingly, to a Global Voices reporter, "Let them march and the next thing you know, narcotics addicts will want to stage their own demonstrations too." While some say the concern is overblown - that very few families actually hold to the tradition - a post on Armenia.newseurasia.net is eye-opening: one blogger talks about being forced to help a bride manufacture a bloodstain and a commenter adds, "I've had a number of girlfriends in Armenia intentionally bleed on the sheets on their wedding night so that their new in-laws see. Sometimes this involves cutting a finger."